MURMANSK – Serious questions about the Arctic environment and air quality degenerated into farce at a seminar in Murmansk devoted to the topic last week as officials juggle figures and a phony scientific NGO presented baked data. Murmansk is a pilot region for a number of projects on protecting air quality. But the talks about reducing the amount of pollution migrating into Norway from Russia’s Northern industrial towns was briefly run off the rails by an NGO calling itself Green Patrol, which has been trumpeting findings of pollution wafting its way from Norway and Finland and into Russia, rather than the other way around. The group’s findings are so ludicrous that the representative it sent to the seminar went so far in an interview with Bellona to dismiss its own claims as insignificant, and debunk its own methodology as unscientific – but not until air quality scientists from Norway had a chance to rake the organization over the coals a bit. According to Roman Pukalov, director of the nature conservancy program with Green Patrol, a group with suspicious – some say state-connected – roots, Scandinavian countries are blowing some 45 percent of all pollution into Russia. The claim is an old one, and has never been substantiated by any actual scientific claims since the group first levied the charge in August. Again, while addressing the conference, Pukalov was unable to back his claim with any data on amounts of pollution even in the most general sense, such as by tonnage, dozens of tons or even by rubber balloons. Nonetheless, he was confident in asserting that Russia should drag the matter to European courts to demand satisfaction, citing the group’s science fiction as the foundation for the case. The gnat of Green Patrol’s research has been dealt with by European scientific organizations before, and it was clearly wasted time for Tore Berlgen, the head scientist dealing with cross-border emissions for the Norwegian Institute for Air Research (NILU) to have to refute Green Patrol’s alchemy once again. “With all due respect to those delivering reports today, I can say with certainty that from the scientific point of view, such research is pseudo-science,” Berglen, who has since august maintained a tone of diplomatic detachment, told the conference. With the agenda back on serious footing, the Murmansk government addressed issues of malodorous industrial emissions that area residents have complained of for years. Alexei Smirnov, minister of natural resources and ecology for the Murmansk Region, said an automated system for monitoring complex and specific – or polluting – substances in the atmosphere of the Kola Peninsula’s industrial cities is under formulation. Some 22 centers make up a system of monitoring nine industrial centers in the Murmansk Region. The system constantly updates a single informational database on air quality conditions in the Regional center. As such, it has been established that Murmansk suffers from concentrations of sulfur oxide, nitrous oxides, carbon dioxides, methane, and traces of hydrocarbons and other factored particles. 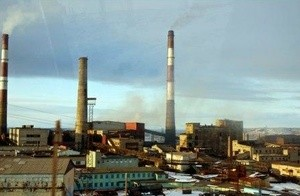 In the Kandalaksha, Kola and Kovdor districts, sulfur dioxide, nitrous oxide and carbon oxides have been measured, and the industrial cities of Nikel, Monchegorsk, and Zapolyarny are primarily affected by sulfur dioxide. An evaluation of pollution emissions in the Murmansk region with the aim of reducing human impact on the region’s environment is planned for the near future. Mikhail Lesovoy, deputy head of the Murmansk’s Regional division of the Federal Agency for Oversight of Natural Resource Usage, or Rosprirodnadzor in its Russian abbreviation, the combined total of pollutants emitted from standard sources in the Murmansk region reached some 250,000 tons in 2012. Some 60 percent of all pollution came from processing centers and mineral mining. He also noted that some 500 million rubles had been paid in 2012 by industries producing pollutants that negatively effect the environment, which covers some 57.2 percent of the total emissions in the area. Not surprisingly, he said that the Kola Mining and Metallurgy Company (KMMC) was the biggest fine-payer in the region by far. The company is a daughter enterprise of industrial giant Norilsk Nikel. “The company paid around 30 million rubles of this [total] sum,” he told the conference. Yelena Siekkenen of the Murmansk office of Hydrometeorology and Environmental Monitoring, or UGMS, in its Russian abbreviation, tallied up the days of unfavorable weather conditions – showing that for some of the most polluting cities surveyed, lousy weather is the norm. Dambirovsky said that according to uninterrupted measurements in 2012, the mid year concentrations of sulfur dioxide in Nikel were some 1.1 of the maximum allowable limit – 1.0 constituting the maximum of what’s allowed – and in Zapolyarny 1.8 the maximum allowable limit. So, Nikel was exceeding the maximum allowable pollution limit by 0.1 and Zapolyarny by 0.8, according to data from Institute of Hydrometeorology, or Girdromet. Dambirovsky said – as many before him and many after him doubtless will, and with nearly no improvements – that in order to make a real dent in emissions, new technology has to be introduced, and that current technology allows only for small reductions in emissions, but nothing dramatic. The group is suspected of having political connections, and that it was set loose with its set of bogus findings in order to upend the delicate diplomacy between Russia and Norway regarding heavy concentrations of sulfur dioxide and other heavy metals that scientists from both sides of the border have said are making their way into Norway from Russia – and have been for the past three decades. In a later interview with Bellona at the sidelines of the conference, Pukalov offered a weak climb-down from several months of his organization’s thundering accusations. “Yes, I agree that this was a one time research experiment, we don’t pretend to be scientific,” he said. “We managed to discover trans-boundary pollution of sulfuric gasses and nitrous oxide measuring about 0.2 to 0.4 of the maximum allowable level,” he said. In other words, Green Patrol discovered that whatever sulfur and nitrous managed to work its way into Russia from Northern Europe fell well short of breaching maximum allowable pollution limits. “I understand this says nothing, but nonetheless this cross border pollution into Russia exists,” Pukalov told Bellona.